Only School offering Free Email Certificate in Florida. Compare us to other Florida Schools. I took the 4 hour Traffic School from another provider and failed the final exam twice. I took the course at Gold and passed the final test on the first try. The course is laid out very well in a very concise and understandable manner. I would recommend Gold Traffic School to anyone who needs to satisfy a Court Order or has elected to take it to avoid Points being assessed on their license or a rate hike on their auto insurance. Great and easy to used ! Everything worked out well. AMAZING!!!! fast cheap easy and they're processing is super fast so even though i waited longer than i should have to deal with my traffic violation I'm fine! :D really spectacular!!! Very convenient way to do a refresh traffic training without leaving your work or home. Just as everyone else says...it's super easy. Is the BDI course really 4 hrs? yes but i did 2 chapters at a time, logged out and back in to continue super easily no problem. the course itself, quizzes and exam at the end were super simple. would highly recommend to anyone that needs or wants to take this course. Safer Drivers, always make smarter Decisions! Before you start comparing us to our competitors, take a moment to understand that we all try to bring (hopefully!) something unique to our students. Following comparison is provided so you can make an educated decision. We'd love to hear your feedback and questions via live chat or a phone call. We are available to help you make the right choice. Whether you choose us or another school. It will only take a minute to register. We assure you of a user-friendly site which is easy to understand. For your convenience your Completion submitted electronically to DMV and Miami Court upon completion. The Gold Traffic School is a fully licensed online traffic and basic driver improvement school, governed by the laws of Florida. All you need is a computer at home and you can learn from us at your own pace and receive the certificate in just 30 minutes. Our online course allows you to re-take the test as many times as you want until you clear the test without sparing any extra cost. Laws change pretty frequently and it is the responsibility of the driver to stay up-to-date. You will never know why you have been pulled over by a police car until you are aware of the changes. Thus, contact us today to know more about our online traffic and basic driver improvement school. If you are looking for the best fully licensed Online Traffic School and Basic Driver Improvement Course, then look no further. Register Gold Traffic School Today! The Gold Traffic School is a licensed Online Traffic School and Basic Driver Improvement Course, governed by the laws of Florida and is accepted by Miami Court. With us, there is no turning back. Just register, select a test and give unlimited re-takes without spending extra money. We are there for you until you pass your test. You heard it right, it will take only 30 minutes to process your result. All you need is a desktop, tab, or a smartphone and sit for the test according to your pace. It doesn’t matter when you need us, what matters is that you do need us. Call our customer support 24 x 7 and let us be at your service. Left the course in between? Well, no worries! Just log in and start from where you left. Feel free to login to our site whenever you want to and resume the course. Your safety matters to us and that’s why we ensure that all your data remains safe with us. We are transparent with our promises and our site is encrypted from top to bottom. Leave stress and worries behind and concentrate only on passing the exam. Is this course Florida State approved? 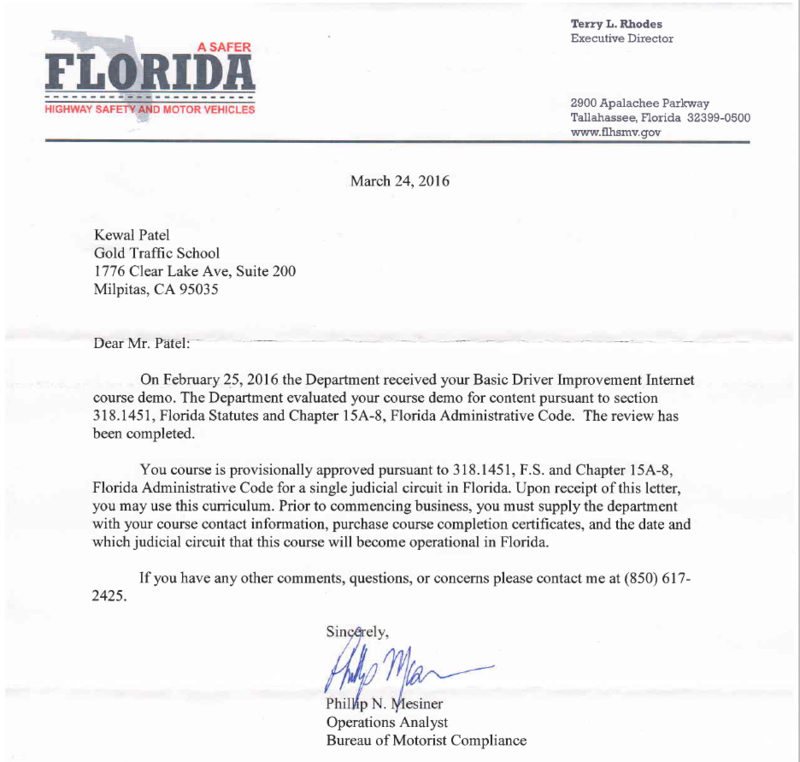 The Florida 4-Hour Basic Driver Improvement (BDI) course should take the state-mandated 4 hours to complete. Yes, you do. The 4-hour course features a 40-question multiple-choice final exam. You must score an 80% or higher to pass. $5.95 includes certificate delivery. Visa and MasterCard are accepted, We do offer a low price guarantee. Simply supply us with the web address of the competing school. We will match upon verification of the final price. All price adjustments must be made prior to course payment. In order to qualify for a Basic Driver Improvement (BDI) course to eliminate the assessment of points, drivers must voluntarily elect this option within 30 days (section 318.14 (4), Florida Statutes) from the citation date and, prior to attending the course, drivers must inform the clerk of court in the county where the citation was issued of this election. if you're taking our 4-Hour or 8-Hour Traffic School course, the thing that you really need is your certificate of completion. This is the document that verifies that you have completed your online course. We understand that there are often important deadlines that you must meet, so upon completion of your course, we'll process your certificate and send it to you via Mail. If you need it faster, we also offer rush processing/express delivery for an incremental fee. Can I Stop and Start the course any time I want? What Happens if I Lost My Florida Traffic Ticket?